For various reasons, traders sometimes miss the breakout phase, which means skipping profits. In forex which has high volatility, a clear breakout does not only happen once. On a number of occasions, breakout even occurred many times in one trading session. Only by taking a breakout, the profit is definitely in the hand. The problem is, not all traders can capture the breakout perfectly. But there's no need to worry, because traders can still take advantage of the next breakout. This second breakout provides equally large profits from the first breakout, and in certain cases the second breakout is actually better than the first. What is the Second Breakout? 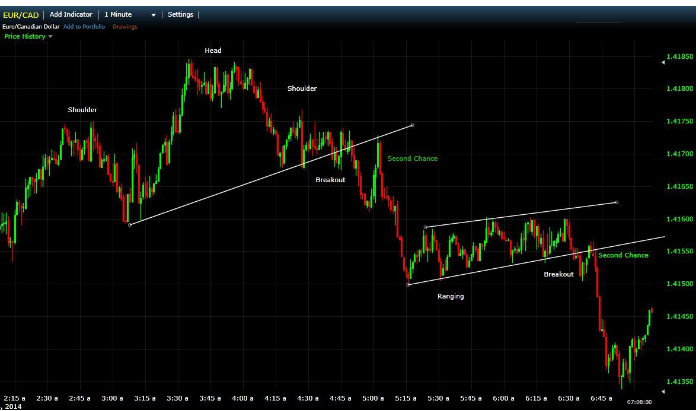 When points are in any position, for example experiencing a range, head and shoulder, triangle, or other patterns, there must be one breakout point in one of these patterns. Breakout is marked when points move out beyond a certain pattern boundary. If the breakout continues to rise and does not go down immediately, then the price will continue to move out of the pattern. This indicates that the price has a clear movement, although sometimes prices will return to the point of previous breakout points. The decline does not have to touch the starting point of the previous breakout, but is more like approaching. If price points experience this condition, new entry points will appear. If the price breaks through the top of a certain pattern, a second chance will appear to buy. Conversely, if the price breaks the bottom of a pattern, the trader will get a good chance to sell or short. When prices are attracted to the starting point of the previous breakout points, this is not the right time to trade. When the current withdrawal starts to slow down and the price starts moving towards the previous breakout, prepare to enter trading mode. Besides taking advantage of the breakout, candlestick patterns can also be used to signal if the withdrawal has stopped and the price starts moving back towards the actual breakout. If the previous breakout direction goes down, wait a moment until the point returns to the initial breakout, and when you see a sign the price starts falling, immediately give a short order. Place a stop-loss order several pips above the top withdrawal point, or place it not far from the entry point. With this approach, the risk will be maintained to a minimum level. Targets of trading are generally based on chart patterns and original breakout prices. The height of the pattern is then reduced by the price breakout. When the original breakout direction is directed upwards, wait until the bottom draw occurs, and when the price starts moving up immediately, make a long order. Place a stop-loss of a few pips under the bottom draw. The target of this trade remains based on the chart pattern and the initial breakout price. The height of the pattern is then added to the price of the breakout. The breakout is actually very difficult to capture, so the second breakout that appears can be another alternative to get profit from forex trading activities. The second breakout provides another opportunity for trading with a breakout strategy after being missed. There will be no more traders who lose capital if they are able to take advantage of the second breakout. Unfortunately, the chance for a second breakout is very rare. Some breakouts are strong enough and can continue to experience a withdrawal so it's not worth trading. When a recall occurs and the potential for a second breakout is imminent, wait until the price starts moving towards the breakout again before starting to enter. However, there is no guarantee that long breakout points can stop the withdrawals that occur, so placing certain orders near the breakout point is not recommended. Traders also don't need to worry if a false breakout appears. False breakout, also called fake breakout, is a point that seems to move out of a certain pattern, but what happens is the opposite. False breakout is tantamount to false expectations for traders because they can deceive and cause capital losses when trading takes place. False breakout can be marked when the point moves up, but suddenly changes direction and falls down, and vice versa. Which is a problem for traders, false breakouts can appear anywhere in the time range at any time. Even so, false breakout can be a good trading tool if traders can make good use of it. This second breakout strategy can work well as an active strategy because it requires traders to participate by always monitoring the market and computer screens. In contrast to the passive strategy where traders only have to set up automatic trading then left. Consider setting profit targets when using the second breakout. The basic strategy above can be changed according to the market situation and the character of the trader himself. At the very least, outline the guidelines when going into the market and trading, also consider the location of stop-loss orders and profit targets. 0 Response to "Peek at the Big Profit Opportunity with the Second Breakout"